Good morning and welcome to the last day of our 5th-anniversary blog hop. Wow! We are simply BLOWN away by your warm response on our blog hops. You have amazed us with your love, comments, and the orders from our store! Thank you, everyone, for your continued support and sweet anniversary wishes. *If you missed the other anniversary blog hop posts, make sure to check them out for more inspiration and an extra chance to win PRIZES! Before we go into the hop details and prizes, we would like to give a BIG shout-out to our fantastic Scrapbook Design Team for their creative contributions. There is no doubt that Altenew wouldn’t have come this far without the help of our extremely talented designers who showcase our products each month. We’ll never be able to thank them enough for all they’ve done for Altenew. In honor of our anniversary celebration, we have asked each of our design team members to share four of their favorite Altenew layouts with you. They are also sharing what they like the most about being on the Altenew Scrapbook Design Team and/or what they like the most about our products. Enjoy FREE U.S. shipping with code HAPPY9M or $5 OFF international shipping with code SHOPPING9M at checkout. Offer valid now through 4/5/2019 at 11:59 pm EDT. Not valid on prior purchases. Cannot be combined with other promo codes. Please click on the blue button below to share a link to the best Altenew projects that you’ve created for the past 5 years. You may enter up to three times. We’ll feature the 8 best entries on the Altenew blog on 4/20/2019. We’d love to see your BEST Altenew projects! Happy anniversary Altenew. Can’t wait to see what you have in store for us in the next five!! Congratulations to one of my new favourites! Another try… I have now been checking my emails daily to see the posts of your products and the beautiful card/scrapbook examples made by your ultra talented people! I look forward to using your gorgeous products for many years to come!!! While I don’t scrapbook, I always learn so much from your scrapbook design team. You find such interesting creative types. Thanks for these fun bloghops and birthday celebrations! How wonderful to see all of the ‘Altenew Best’ from everyone in the link up! So many beautiful projects! This was a fun blog hop. I never get tired of seeing your products. You have, I think, the best florals. I love the layered sets. They always have such a realistic look. Happy Anniversary! I hope you have many more! Yay? Loving all of the celebrations! I have followed you from before you were even a company through owner personal blogs, and you have never disappointed me with each new release, new type product, and the services you offer. Wishing you many many more years of such wonderful success! Congrats on completing 5 years. Wishing you many more years of success. I am really enjoying the amazing hops every day. There is so much great inspiration! Hapypy 5th anniversary Altenew, 5 years of amazing products have gone by and many more to come. Congratulations and Happy Anniversary!!! I’ve loved everything you have accomplished and look forward to more! You guys have an awesome team! Happy 5th anniversary! Beautiful layouts!! I’m excited to go hop and see what everyone has created today! I haven’t been stamping long but I found Altenew quickly and it became one of my favorite stamping companies. I love all of your stamps and medias. I have your watercolor set, 2 sets of watercolor brushes, some stamps, some embellishments, a set of markers and I’m working on gathering some inks. It’s taking time but I’m trying to collect everything I love from Altenew. Congratulations and happy anniversary to one of my favorite companies!! I love how versatile the creations are – so many ideas from a few sets! Happy Birthday Altenew! i love supporting an American company with my craft dollars! Would love to see dogwoods, nasturtiums and daphne sometime soon. Congratulations on your anniversary. Your products are the most beautiful. Wishing you growth, success and a lots of sales! Can always depend on Altenew to offer the most detailed and lovely floral stamps. Happy Anniversary! I know I’m late to the party! I participated on day one & then was away on business!! I wanted to stop back by and say congrats again!!! I love the wonderful posts your design team comes up with. Their colors and perspectives are so inspirational to me. Happy 5th and Happy Spring!!! I’m not a scraper but I get so many wonderful ideas and inspiration from the Altenew Scrapbook Design Team for mixed media and cardmaking, they never cease to amaze me. Altenew sure knows how to bring together the best products and the best design teams in this industry!! 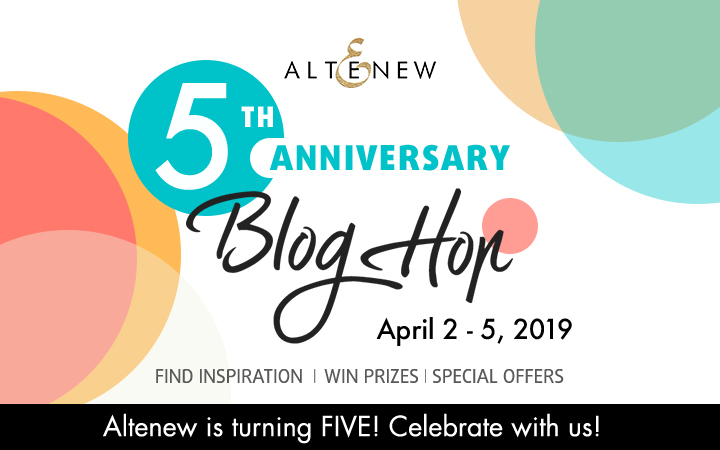 Happy 5th Anniversary Altenew and for this awesome, fun, inspiration fill celebration. Thank you as well to all the Designers and Companies that joined in and all the amazing chances to win wonderful prizes. Here’s to many more years of being creative and having fun! Happy Anniversary! Love seeing all these beautiful creations with your wonderful products! I’m a big fan of all of these layouts. I’ve always been intimidated to make layouts but everytime I see Altenew designers’ work of arts I’m always inspired :) happy birthday / anniversary! Absolutely stunning layouts here! Give me all the flowers and all the colors!!! I’m always amazed at the layouts on the Scrapbook Blog–creative & gorgeous! Happy Anniversary! Your company has beautiful products. Happy Anniversary Altenew! Thank you for 5 years of quality products and endless inspiration! Happy 5th Anniversary to Altenew!! Many thanks for lovely designs, beautiful inks and boundless inspiration!! Thank you, Altenew, for allowing us to post comments on the great and outstanding designers. Loving it. You have an amazing Scrapbook Design Team. They are very talented and creative. Thanks for inspiring us with all these gorgeous projects.